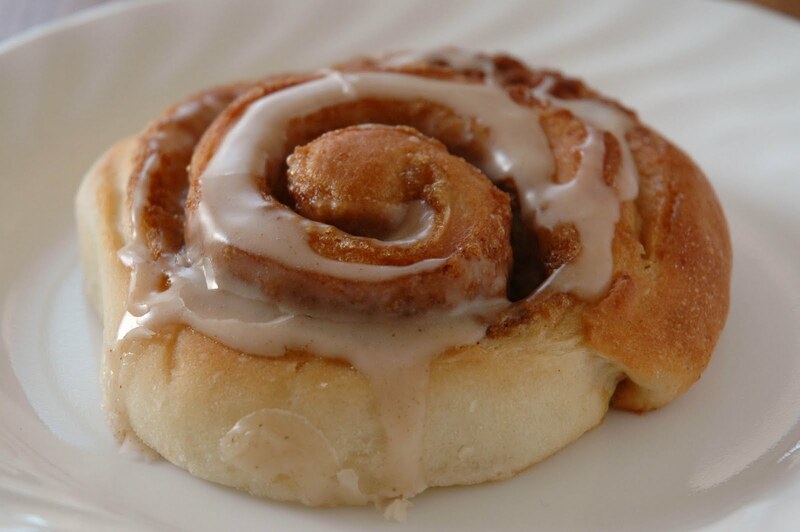 Foodspiration: Cinnamon Rolls with A Secret--Potatoes! 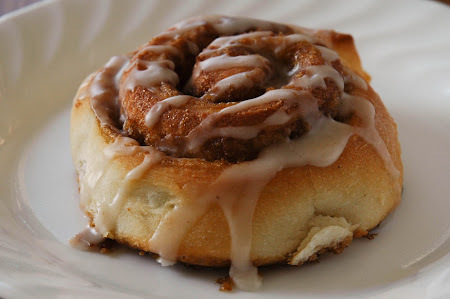 Cinnamon Rolls with A Secret--Potatoes! There's nothing like the taste of a homemade cinnamon roll and if there was a queen of them, it would be my grandma. Growing up, they were a special treat for me when we would visit. 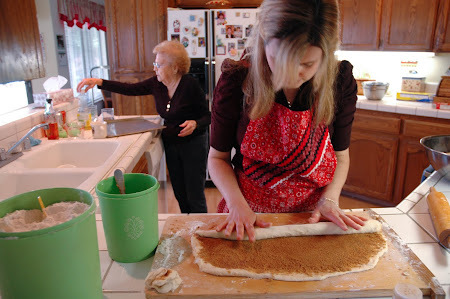 The soft, yeast-leavened dough with the sweet and spicy mixture of brown sugar and cinnamon was an inspiration to me and fostered my love of baking to this day. 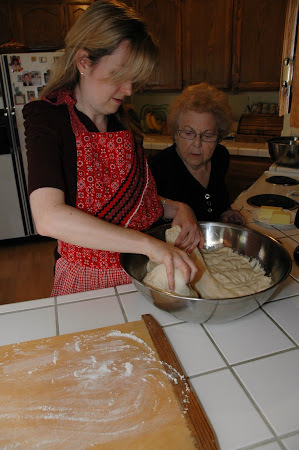 I was younger, I would sometimes spend a week in the summer with my grandma making deliciously leavened things like doughnuts, bread, and rolls. 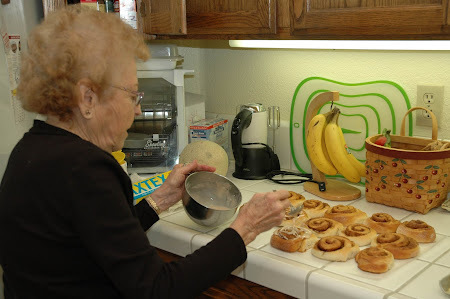 So you can imagine how excited I was to spend a day with my grandma making her cinnamon rolls together and to share it on our blog. With Justin taking some photos along the way and baby P in good hands with his grandparents and godparents in the other room, we proceeded to fill the house with the amazing smell of leavened dough and make five and a half dozen rolls. 1. 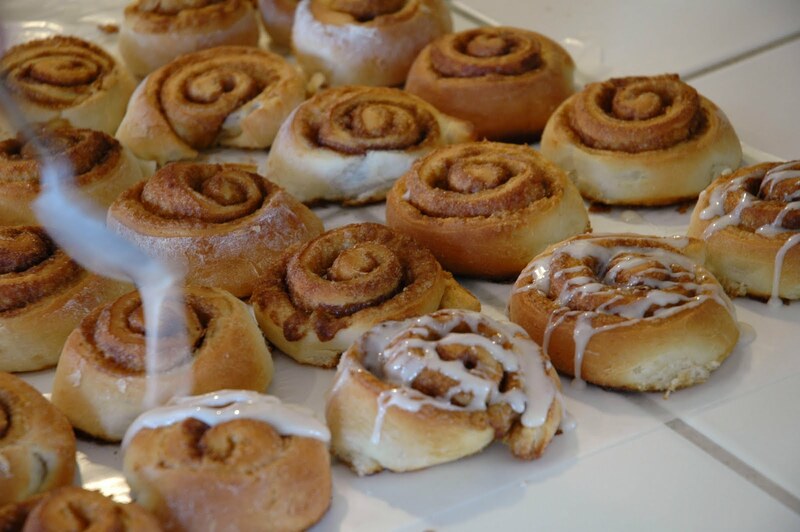 Cinnamon rolls are a labor of love. They have two proofs and therefore require some patience to let the yeast work its magic. 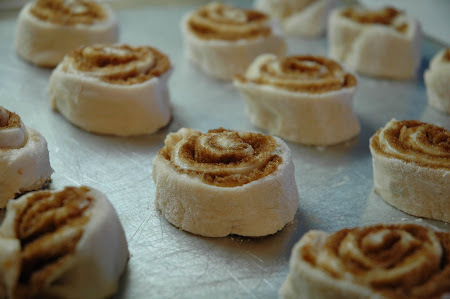 Not to mention that you have to spread the brown sugar and butter and cinnamon and roll up and slice multiple times. It's not a 30 minute recipe! 2. This is a huge batch size. The original recipe is from my great-aunt Dorothy who lived in Nebraska and it's enough to feed everyone on the farm. This batch made about six dozen rolls. I once made this in college and underestimated what"double in size " really meant and I ended up with what looked like a dough explosion all over the oven and heating element. Whoops. Note to self- this requires a giant bowl to proof as shown in the above photo. 3. The secret ingredient is...mashed potatoes and potato water. Yes, that's right and it's delicious. what is the potato doing? Adding a fair amount of starch to the dough and giving a nice and tender texture. 4. We didn't follow it exactly. Grandma could make this with her eyes closed and I watched in awe as she adjusted the yeast, water and flour all from experience. As a scientist who measures everything, this was such a leap of faith for me but her experience reigned supreme as everything turned out as planned. 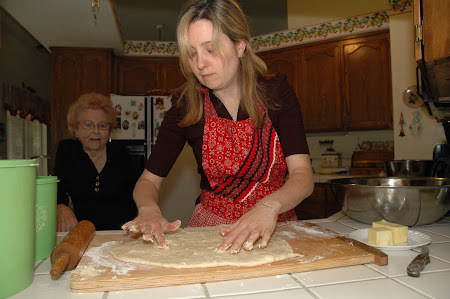 She had a lot of good advice as I rolled the dough and spread the filling. 5. 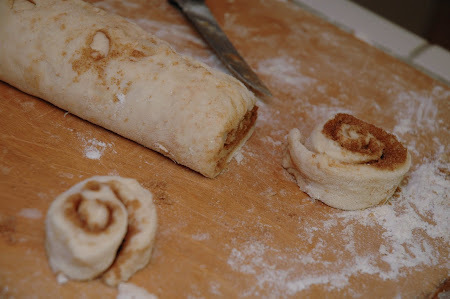 Cinnamon roll dough is wonderfully tactile. Not only do you touch it, you knead it, you develop it, you must know how it feels in order to make it. So many other foods are stirred with utensils, gingerly poked and prodded for doneness but cinnamon rolls are so much more hands-on. Mix potatoes with lard, cream well. Add sugar and potato water. Add eggs. 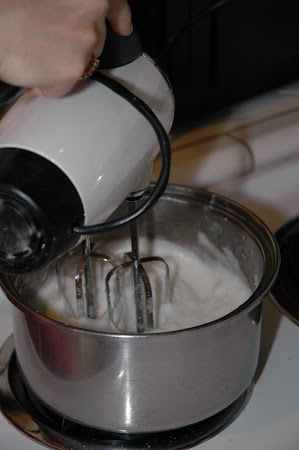 Dissolve the yeast in warm water and add to mixture along with some of the flour. Let set until bubbly. 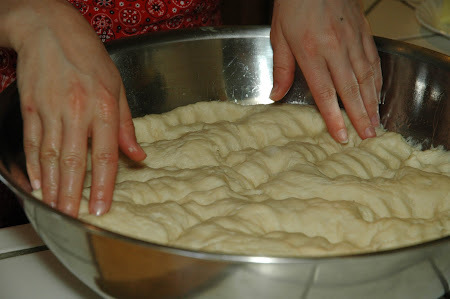 Add remaining flour to make soft dough. Knead. Let rise until double (we put it into a warm oven- turned on the lowest setting and then extinguished). Punch down then roll out into sheets. Generously spread with butter, sprinkle with cinnamon and sugar evenly. Then roll into a log and slice. Place on greased cookie sheet (we like a cookie sheet for individual rolls. you can put them into a greased glass pyrex where they will touch and bake together). Let rise. Bake at 350 deg F for about 15 minutes- take a look and bake longer if necessary. Let cool. Mix powdered sugar and milk to an icing consistency and drizzle on cooled rolls. And there you have it, enough for 5 to 6 dozen cinnamon rolls- plenty to share! Special thanks to my grandma for spending the whole day making these with me!